Rema Tip Top 5/16" Radial RemaStem BOWES RTR 194 Box of 10. EMA TIP TOP's pre-cured, self-vulcanizing Inserts are specially contoured for easy installation. 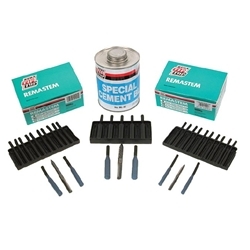 For best results always select the corresponding REMA TIP TOP repair unit, carbide cutter and Special Cement BL (non flammable) or Special Blue Cement (flammable) for a permanent, reliable repair.